D Riebau, J Selph, A Jarquin-Valdivia. Acute Ischemic Strokes after Central Line Placement. The Internet Journal of Emergency and Intensive Care Medicine. 2004 Volume 8 Number 2. Objective: To describe an uncommon complication of cervical central venous catheter insertion. Setting: A major academic medical center. Patient: A 53-year-old female transferred to our institution with several acute cerebral infarcts in the anterior and posterior cerebral circulations after inadvertent central line placement into her right vertebral artery, with the length of the catheter in the aortic arch. Interventions: Surgical removal of intravascular catheter. Measurements and Main Results: Good clinical outcome. Conclusions: A complication of cervical venous catheter insertion can be inadvertent vertebral artery cannulation with subsequent ischemic strokes. A 53-year-old female was admitted to an outside hospital for cachexia and gastroparesis following partial gastrectomy for severe gastric ulcerative disease. Management required placement of a triple-lumen central line (TLC) for total parenteral nutrition (TPN). Initial attempts at placing a right subclavian vein were unsuccessful. Subsequently, a right cervical TLC was placed and TPN was initiated. Few minutes thereafter, the patient developed weakness in her left upper extremity, which quickly progressed to complete left hemiparesis and hypesthesia. Over the next several hours, her weakness improved, but she continued to have numbness in the left hand. A non-contrasted head CT showed no evidence of intracranial hemorrhage. She was started on clopidogrel and transferred to our hospital for further evaluation. Upon arrival, magnetic resonance imaging (MRI) and angiography (MRA) of the head were obtained which showed multiple areas of acute infarctions in the right cerebellar hemisphere, right and left occipital lobes, throughout the right middle cerebral artery territory, and a small infarct in a distal left middle cerebral artery branch. There was no evidence of hemorrhage. The intracranial MRA was normal. A transthoracic echocardiogram (TTE) demonstrated no cardioembolic source of emboli. However, no color Doppler or microbubble study to evaluate for the presence of a right-to-left shunt was performed. As a right-to-left shunt was in consideration as a source of the strokes, microbubble-contrasted TCD was done. Due to her poor peripheral venous access, the microbubble solution (9 cc normal saline and 1 cc air mixed via a 3-way stopcock) was injected into the right cervical TLC. The left MCA was interrogated without difficulty via the left middle temporal ultrasound window. The study was markedly positive immediately (<3 cardiac cycles) after injection (Figure 1), leading to the suspicion of an arterial location of the TLC. A blood gas sample confirmed arterial blood. TPN was stopped. 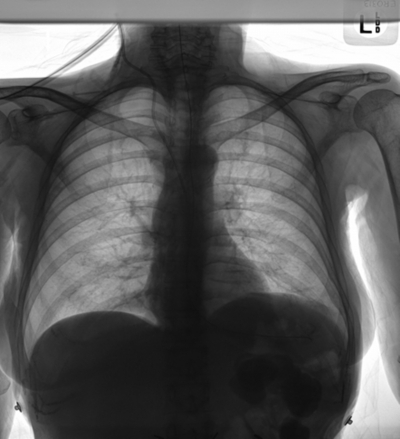 A chest x-ray (Figure 2) was obtained that showed an unusual course of the TLC. A CT angiogram of the neck demonstrated that the TLC tracked lateral and posterior to the right internal jugular vein without puncturing it, and went on to enter the right vertebral artery, the tip was positioned in the aortic arch. The patient underwent right neck exploration with direct removal of the TLC and proximal thrombectomy with right vertebral artery primary repair. Following surgery, the patient's neurological status continued to improve. No other clinical evidence of ischemia or embolism was found. Figure 1: TCD with microbubble injection of the RMCA demonstrating the early occurrence of a curtain effect. Arrow is the point of microbbuble injection into the TLC. Figure 2: A. Anterior-posterior chest X-ray demonstrating the aberrant course of the right central line catheter, placed in the right vertebral artery extending into the aortic arch. Cerebral infarction is a rare complication of central venous line access. One retrospective review 3of 4487 IJV line insertion attempts using landmark techniques found that 5.9% were associated with carotid artery injury. The performance of TCD with microbubbles via the TLC helped suspect the misplaced catheter. TCD with microbubbles studies that are strongly positive and that occur immediately (under 3 cardiac cycles) after injection should be clues that the access port is arterial rather than venous, or that a proximal large right-to-left shunt is present. No reported neurological complications have been described in patients undergoing microbbuble injection for right-to-left shunts evaluation, even in the context of large arterio-venous communications16. Our patient did not have any neurological symptoms or signs associated to the microbubbles injection into the arterially placed central catheter. Several publications have suggested means to prevent central line misplacements, such as: by transduction of vascular pressure waveforms11, determination of blood gases prior to dilation of the vessel, and by real-time ultrasound guidance17. Less commonly, fluoroscopy and venography are used18. We have accomplished similar results in assuring venous placement of TLCs by injecting a small amount of saline with air into the vessel prior to vein dilation, while visualizing the transit of the air bubbles via the right side of the heart while performing subcostal echocardiography (unpublished data). Once a central line has been placed, a chest x-ray should be obtained to determine the position of the catheter, including its depth19. This case illustrates a complication of inadvertent catheterization of the right vertebral artery while attempting to place a cervical central venous line, which resulted in multiple anterior and posterior cerebral circulations embolic infarcts. Complications during central line placement are a reality that we always aim to reduce, but occur in a small percentage of patients. Possible complications from central venous catheterizations must be considered before and after any central line insertion, including acute ischemic strokes. 1. McGee DC, Gould MK. Preventing complications of central venous catheterization. N Engl J Med 2003;348(12):1123-33. 2. Marino PL. The ICU Book. 2nd ed. Baltimore: Lippincott Williams & Wilkins, 1998. 3. Reuber M, Dunkley LA, Turton EP, Bell MD, Bamford JM. Stroke after internal jugular venous cannulation. Acta Neurol Scand 2002;105(3):235-9. 4. Zuha R, Price T, Powles R, Treleaven J. Paradoxical emboli after central venous catheter removal. Ann Oncol 2000;11(7):885-6. 5. Playfor SD, Smyth AR. Paradoxical embolism in a boy with cystic fibrosis and a stroke. Thorax 1999;54(12):1139-40. 6. Schummer W, Schummer C. Another neurological complication of central venous cannulation. Eur J Anaesthesiol 2002;19(1):73-5. 7. Bohlega S, McLean DR. Hemiplegia caused by inadvertent intra-carotid infusion of total parenteral nutrition. Clin Neurol Neurosurg 1997;99(3):217-9. 8. Fennell SJ, Benton C. Cortical blindness following unintended catheterization of the subclavian artery. J Pediatr 1977;90(3):491. 9. Finlay DJ, Sanchez LA, Sicard GA. Subclavian artery injury, vertebral artery dissection, and arteriovenous fistulae following attempt at central line placement. Ann Vasc Surg 2002;16(6):774-8. 10. Burger T, Tautenhahn J, Grote R, Halloul Z. Diagnosis and management of trauma and iatrogenic induced arteriovenous fistulas in the neck. Vasa 1999;28(4):297-300. 11. Mainland PA, Tam WH, Law B, Kee WN. Stroke following central venous cannulation. Lancet 1997;349(9056):921. 12. Bernik TR, Friedman SG, Scher LA, Safa T. Pseudoaneurysm of the subclavian-vertebral artery junction--case report and review of the literature. Vasc Endovascular Surg 2002;36(6):461-4. 13. Cihangiroglu M, Rahman A, Yildirim H, Burma O, Uysal H. Iatrogenic vertebral artery pseudoaneurysm: US, CT and MRI findings. Eur J Radiol 2002;43(1):14-8. 14. Amaral JF, Grigoriev VE, Dorfman GS, Carney WI, Jr. Vertebral artery pseudoaneurysm. A rare complication of subclavian artery catheterization. Arch Surg 1990;125(4):546-7. 15. Sloan MA, Mueller JD, Adelman LS, Caplan LR. Fatal brainstem stroke following internal jugular vein catheterization. Neurology 1991;41(7):1092-5. 16. Droste DW, Schmidt-Rimpler C, Wichter T, Dittrich R, Ritter M, Stypmann J, et al. Right-to-Left-Shunts Detected by Transesophageal Echocardiography and Transcranial Doppler Sonography. Cerebrovasc Dis 2004;17(2-3):191-196. 17. Hind D, Calvert N, McWilliams R, Davidson A, Paisley S, Beverley C, et al. Ultrasonic locating devices for central venous cannulation: meta-analysis. Bmj 2003;327(7411):361. 18. Knutstad K, Hager B, Hauser M. Radiologic diagnosis and management of complications related to central venous access. Acta Radiol 2003;44(5):508-16. 19. Carey HB, Boltax R, Dickey KW, Finkelstein FO. Bilateral renal infarction secondary to paradoxical embolism. Am J Kidney Dis 1999;34(4):752-5. Adrian A. Jarquin-Valdivia, M.D., R.D.M.S.